The Chief Executive of the FAI John Delaney is to step aside from his role with immediate effect. He will assume a different role within the Association, that of Executive Vice President with responsibility for all UEFA and FIFA matters including the proposed World Cup 2030 bid with the UK, the Under 21 Euro bid with Northern Ireland and matters pertaining to the Aviva Stadium from an FAI perspective. It is understood that Ireland would host a significant number of games in the World Cup should the proposed bid prove successful. The decision to step aside comes amid controversy around a €100,000 bridging loan which John Delaney provided to the association in 2017 which was repaid to Mr Delaney within a matter of weeks. In a statement this evening, the association said the decision to split the roles was taken in recent weeks following a report into governance at the association undertaken by Jonathan Hall which recommended that oversight functions should be split. The current Chief Operating Officer at the FAI, Rea Walsh, will act as interim CEO starting on Monday next. Th recruitment process for a new CEO with immediate effect with interviews expected to take place in late April and an appointment ratified by the Board in May. It is planned to unveil the new CEO at the 2019 AGM of the FAI in Trim, County Meath. It is understood a full public procurement process will be undertaken until the full time role of CEO is filled. The Chair of the Oireachtas Committee on Transport, Tourism and Sport Fergus O'Dowd has described Mr Delaney's stepping down as "a very significant development". 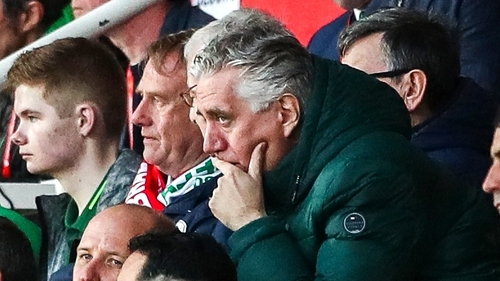 The FAI is scheduled to appear before the committee on 10 April. A statement from the organisation earlier this week said that Mr Delaney would lead the delegation at the meeting. Mr O'Dowd told RTÉ News that the committee will be reflecting on this evening's news and all of the issues that have been raised, at its next meeting on Wednesday.